HOW TO LOVE DIFFICULT PEOPLE- Prickly, defensive, nasty, volatile, withdrawn, miserable...aren't there days when you feel surrounded by difficult people? How do you cope? You can try avoiding them, gossiping about them, or giving them a piece of your mind. But wait! Don't your reactions make you hard to love too? 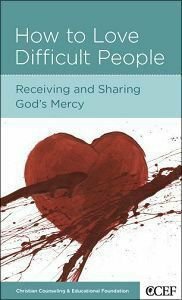 William P. Smith explains that learning how to deal with difficult people starts with understanding that God's pur-suing love is not just for them; it's for you too. You need God's love and forgiveness just as much as they do. Know-ing the love of God will change your attitude, your goals, and your actions toward the difficult people in your life. And that just might encourage them to change too! About "How to Love Difficult People (Christian Counselling & Educational Foundation Series)"